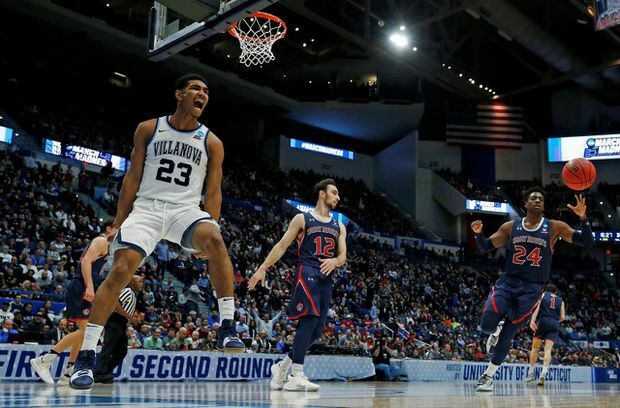 Villanova's Jermaine Samuels screams after his dunk against St. Mary's Tommy Kuhse and Malik Fitts during the second half of a first-round men's college basketball game in the NCAA Tournament on March 21, 2019, in Hartford, Conn.
Phil Booth scored 20 points, fellow senior Eric Paschell added 14 and No. 6 seed Villanova held off Saint Mary’s 61-57 in the first round of the South Region. Jordan Ford and Malik Fitts each had 13 points for Saint Mary’s (22-12), which never trailed by more than eight. The 11th-seeded Gaels, who pulled off an upset win over Gonzaga in the West Coast Conference Tournament, had a chance down the stretch in this one. Ford’s basket in the lane after a few nifty moves got the Gaels within six points at 61-55 with 34 seconds left. After Paschell missed a foul shot on the other end, Fitts cut the deficit to four points with a leaner in the lane. The Gaels had two more chances in the final seconds after a foul by Booth and some missed free throws. But Fitts hit the rim on a 3-point attempt and Saddiq Bey stole the ball from Ford in the final seconds to seal the win. SALT LAKE CITY – One year after dreamers and underdog lovers rejoiced at top-seeded Virginia’s first-of-its-kind, first-round loss, the Gonzaga Bulldogs crushed any thought of a repeat with a wire-to-wire 87-49 thumping of Fairleigh Dickinson in the West Region. Rui Hachimura led the Zags (31-3) with 21 points and eight rebounds. By the time Gonzaga turned it over when Josh Perkins tried flipping a no-look pass backward to Killian Tillie, coach Mark Few looked barely awake, sitting in his chair, cheek cupped in his hand. The Bulldogs led 70-34. The Knights (21-14) were unable to repeat their amazing shooting three nights earlier in a come-from-behind win over Prairie View A&M in the First Four. Fairleigh Dickinson shot 30 per cent and went 6 for 21 from 3-point range. Its star from the win, Darnell Edge, had trouble getting any looks, let alone good ones. He went 2 for 11 for seven points. Murray State Racers guard Ja Morant reacts during a time out at XL Center. Ja Morant recorded the ninth triple-double in the NCAA Tournament since 1987 as Murray State trounced fifth-seeded Marquette 83-64 in the first round of the West Region on Thursday. Murray State continued a trend of a No. 12 seed winning at least one game in all but three tournaments since 2001 – including last year’s – but this looked nothing like an upset. DES MOINES, Iowa – Kevarrius Hayes scored 16 points, Jalen Hudson added 15 and 10th-seeded Florida beat Nevada 70-61 in the West Region in the first round of the NCAA Tournament after squandering most of an 18-point lead. Andrew Nembhard, whose last-second shot beat LSU in the Southeastern Conference Tournament last week, drove to the basket for a layup with 1 1/2 minutes left and Florida scored the last seven points after the Wolf Pack had cut the lead to two points. The Gators (20-1) won their tournament opener for the third straight year and became the third double-digit seed to win on Thursday. Cody Martin scored 23 points and twin brother Caleb Martin had 19 for the Wolf Pack (29-5). The two combined for 28 of their team’s 33 points in the second half. Abilene Christian's Jaren Lewis splits Kentucky defenders Keldon Johnson, left, and Nick Richards. 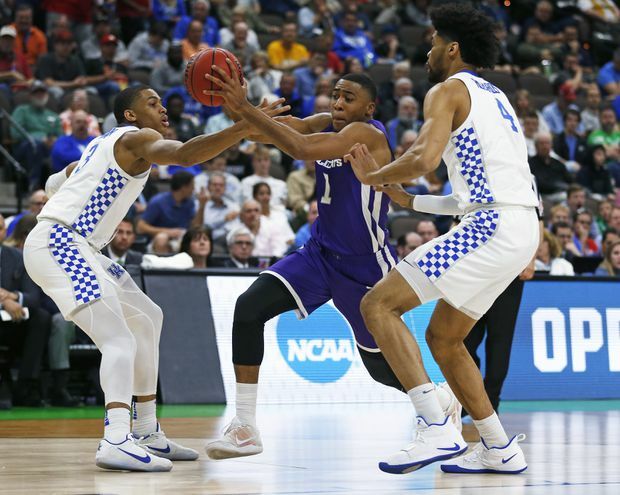 JACKSONVILLE, Fla. – Keldon Johnson scored 25 points in a huge mismatch that was over by halftime, and second-seeded Kentucky romped to a 79-44 victory in the Midwest Regional over NCAA Tournament newcomer Abilene Christian. The Wildcats shot 60 per cent in the opening period, held Abilene Christian to 5 of 26 from the field and went to the locker room with a 39-13 lead. Even without PJ Washington, who sprained his left foot in the Southeastern Conference Tournament, the Wildcats had far too many weapons for the Southland Conference representative, a No. 15 seed. Reid Travis added 18 points and Tyler Herro 14. Jaren Lewis led Abilene Christian with 17 points, the only player in double figures. The big question: Will Washington be able to go? Kentucky coach John Calipari tweeted before the game that a foot specialist confirmed the injury was only a sprain, not a fracture. Maryland was clinging to a one-point lead and the shot clock was off as Belmont (26-6) had a chance to win it at the buzzer. The Bruins didn’t bother calling a timeout to set up a play; they knew what they wanted to do – a backdoor pass to Windler. But Morsell anticipated the pass and stepped in front of Windler to pick intercept the pass while the Belmont star tumbled to the court. DES MOINES, IOWA - MARCH 21: Minnesota Golden Gopher Dupree McBrayer takes a shot against the Louisville Cardinals at Wells Fargo Arena in Des Moines, Iowa. 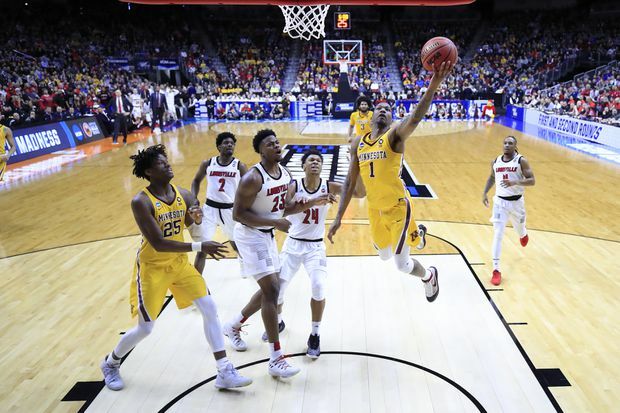 DES MOINES, Iowa – Minnesota won its first NCAA Tournament game in six years behind 24 points from freshman Gale Kalscheur as the 10th-seeded Gophers rolled past Louisville in the opening round of the East Region. It was the first tournament win in Richard Pitino’s six seasons coaching the Gophers and came against the school that fired his father, Rick Pitino, in 2017. Jordan Murphy and Amir Coffey each had 18 points for Minnesota (22-13), which knocked down 11 3s despite entering play ranked 344th nationally in made 3s per game. The Cardinals went to a full-court press in an effort to slow the surging Gophers. But that just left Kalscheur open from the same spot on back-to-back possessions, and he drilled two 3s to give Minnesota a 59-43 lead. Cunningham led Louisville (20-14) with 22 points, and Steven Enoch had 14. SALT LAKE CITY – After a teammate passed up an open layup that could have tied the game, New Mexico State’s Terrell Brown was fouled behind the arc and missed two of three free throws as the Aggies dropped a heartbreaker to fifth-seeded Auburn in the Midwest Region. The Aggies (30-5) were trailing 78-76 when guard A.J. Harris had his defender beat and looked to be headed to the glass for the tying bucket. He instead lobbed out to Brown, who was spotted up at the elbow for a possible game-winner. Brown missed but was fouled with 1.1 seconds left. With Auburn’s J’von McCormick grabbing his throat as Harris toed the line, Brown missed the first, made the second, then watched the third one rim out. Auburn (27-9) knocked the ball out of bounds on the rebound and New Mexico State had one more good look, but Trevelin Queen’s 3 at the buzzer was an air ball. Michigan Wolverines forward Ignas Brazdeikis puts down an emphatic dunk during a game against the Montana Grizzlies at Wells Fargo Arena. DES MOINES, Iowa – Cassius Winston scored 26 points and second-seeded Michigan State held off Bradley in the East Region. Mfiondu Kabengele had 21 points and 10 rebounds, and Florida State held off a barrage of 3-pointers from 13th-seeded Vermont in the opening round of the West Regional. The America East champions stayed close by hitting 16 of 32 3-point attempts. The Seminoles countered by wearing out Vermont down low, outscoring the Catamounts 30-14 in the paint. A dunk by Kabengele gave Florida State a 50-45 lead with nine minutes left, part of a 6-0 run that put the Seminoles ahead for good. Another by the 6-10 sophomore made it 61-53, and the cheers of Vermont fans, who made the four-hour drive south from Burlington, gave way to the tomahawk chop from behind Florida State’s bench. LSU guard Tremont Waters reacts after rebounding the ball while being defended by Yale guard Alex Copeland. 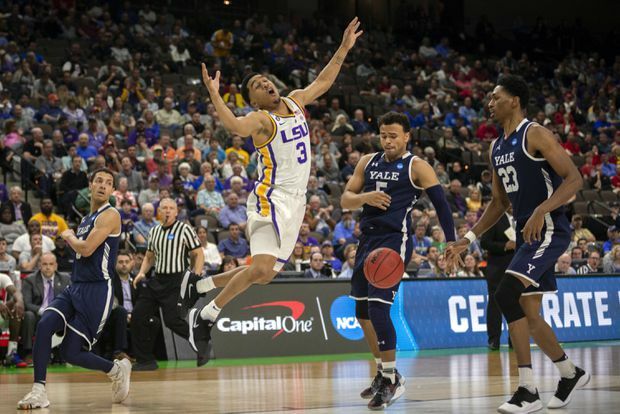 JACKSONVILLE, Fla. – Skylar Mays hit four free throws in the final 15 seconds to help embattled LSU slip past 14th-seeded Yale. SALT LAKE CITY – Dedric Lawson had 25 points and 11 rebounds, and fourth-seeded Kansas dominated inside for an 87-54 rout over Northeastern in the Midwest Region. The fourth-seeded Jayhawks (26-9) had a notable size advantage inside and used it, outscoring the Huskies 50-16 in the paint while grabbing 17 more rebounds. Devon Dotson controlled the offence and scored 18 points, while Dedric’s brother, K.J., chipped in 13 points. Kansas shot 56 per cent and advanced to Saturday’s second round against fifth-seeded Auburn. The best shot for the 13th-seeded Huskies (23-11) was to make their 3-point tries. They didn’t. The Colonial Athletic Association champions went 6 for 28 from the arc after finishing the regular season 17th in Division I at 38.6 per cent. Sharpshooter Vasa Pusica had a hard time getting separation from the Jayhawks’ athletic guards, finishing with seven points on 2-of-11 shooting. Jordan Roland had 12 points to lead the Huskies, who shot 28 per cent overall. 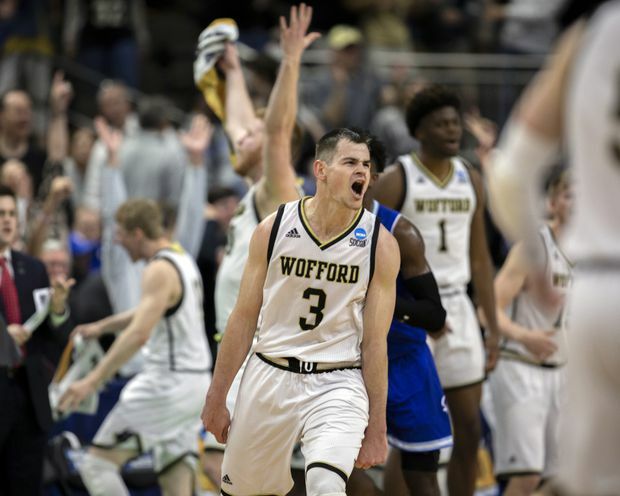 Wofford guard Fletcher Magee celebrates after hitting a three-point shot during the final moments of the second half against Seton Hall in Jacksonville, Fla., on March 21, 2019. JACKSONVILLE, Fla. – Fletcher Magee has led Wofford to the first NCAA Tournament victory in school history. Magee hit seven treys to set the Division I career record for 3-pointers, pouring in 24 points to lead seventh-seeded Wofford to an 84-68 victory over Seton Hall in the first round of the NCAA Tournament on Thursday night. Wofford (30-4) was 0-4 in the NCAA tournament before its victory over the 10th-seeded Pirates (20-14). It was its 21st consecutive victory overall. Magee now has 509 3-pointers in four seasons, breaking the career mark set by Oakland’s Travis Bader in 2014. Duke’s J.J. Redick (457), Tennessee’s Chris Lofton (431) and Davidson’s Stephen Curry (414) also rank in the top 10. The 6-foot-4 guard was 7 of 12 behind the arc, none bigger than his 3 from the corner in front of his bench in the second half. The first two were wide-open looks that caused Seton Hall coach Kevin Willard some angst, and the third a contested shot that brought the Wofford faithful to their feet and put the Terriers up 76-66 with three minutes to play. The Terriers advance to face No. 2 seed Kentucky in the second round Saturday. The Wildcats advanced with a 79-44 blowout of Abilene Christian, but they are expected to be without their leading scorer and rebounder, PJ Washington. He’s wearing a cast on his sprained left foot and it looks like he won’t be available on the opening weekend of the tournament. SALT LAKE CITY, Utah – Makai Mason scored 22 points and Baylor set a school NCAA Tournament record with 16 3-pointers to beat Syracuse in the West Region. The ninth-seeded Bears (20-13) found gaps in Syracuse’s 2-3 zone, mostly by getting the ball into the high post or driving and kicking out. Baylor nearly matched the school tournament record of 11 3-pointers in the first half (10) and made 16 of 34 overall. Baylor shot 54 per cent and slowed Syracuse’s 3-point barrage in the second half to earn a shot at top-seeded Gonzaga on Saturday. No. 8 seed Syracuse (20-14) matched the Bears nearly 3 for 3 in a stellar first half before bogging down in the second. Elijah Hughes had 25 points and hit seven of the Orange’s 12 3-pointers. Tyus Battle, who started at point guard in place of suspended senior Frank Howard, scored 16 points after missing both of Syracuse’s ACC Tournament games with a bruised back. Purdue Boilermakers guard Carsen Edwards reacts at the end of the first half against the Old Dominion Monarchs in the first round of the 2019 NCAA Tournament at XL Center in Hartford, Conn.
HARTFORD, Conn. – Carsen Edwards scored 26 points and third-seeded Purdue coasted to victory against Old Dominion in the first round of the NCAA Tournament. The third-seeded Boilermakers (24-9) will play reigning NCAA champion Villanova, the sixth-seed in the South Region, on Saturday. Edwards, the Big Ten’s leading scorer, has been slumping recently and dealing with a sore back that he insisted was fine on Wednesday. The junior guard had shot 32 per cent in his last 11 games, and was 7 for 33 from 3-point range in his last three games. Ahmad Caver scored 19 points and B.J. Stith had 14 for Old Dominion (26-9). The Monarchs shot 27 per cent from the field in their first NCAA appearance since 2011. The Boilermakers scored the last 11 points of the first half as ODU went stone cold. The Monarchs missed their last 11 shots and went scoreless for 6:17 as Purdue took a control and led 32-19 at the break. It got no better for the Monarchs in the second half. DES MOINES, Iowa – Charles Matthews had 22 points and 10 rebounds in his best performance since coming back from injury, and No. 2 seed Michigan put away Montana early in the first round of the NCAA Tournament. Montana missed 13 of its first 16 shots and trailed by 13 points 10 minutes into the game.